The American DJ Fun Factor LED is a 2-FX-IN-1 DMX LED Moonflower + Strobe Lighting effect with 5 lenses and 4 strobe strips. It features red, blue, green and white LEDs. This effect offers small clubs, bands, roller rinks and mobile entertainers the convenience of having multiple effects in one light show without having to transports multiple fixtures. The Fun Factor LED is easy-to-use and has 3 operational modes: DMX controller, Master/Slave & Sound Active. There are several built-in programs when used in Sound Active or Master/Slave modes. Users can also use the easy-to-use UC3 controller from American DJ to turn the unit On/Off and scroll through different programs. Up to 17 Fun Factor LEDs may be power linked together via the units IEC connectors. 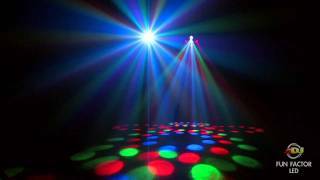 Considering purchasing the American DJ Fun Factor LED RGBW DMX LED Effect? Have questions? Ask people who've recently bought one. Do you own the American DJ Fun Factor LED RGBW DMX LED Effect? Why not write a review based on your experience with it. A really cool looking effect and works very well in all light shows!!! 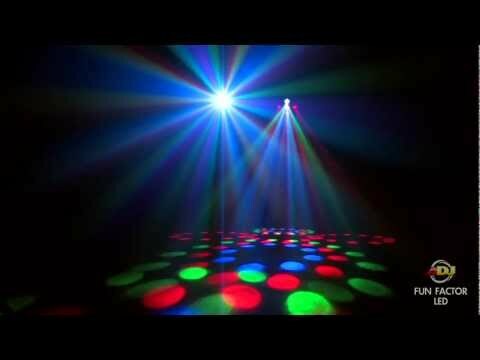 Seen a video for American DJ Fun Factor LED RGBW DMX LED Effect online or have you own video? Check out American DJ Fun Factor LED RGBW DMX LED Effect on DJkit.com!